← Sweet Valley High (The Book Series): Season 3 (Part 7) – The End And All Of Those Fun Extras! May Day is a thing with me. I mean it might be corny, but I love leaving baskets of goodies for neighbors and friends on the first day of the month. I used to do this when I was younger, though it was less of a basket and more like a candy bar or something like that. I would ring the bell and run and hide behind a tree. But back then I would keep doing it and hiding until I was eventually discovered. I’m not sure why I did that back then, I don’t think it was for the credit, more like tag and hide and seek. I mean I left things for my friends, my own age. As an adult, you’d think I’d be over such things. I mean my husband and I don’t have kids, so what’s my excuse to be all… kid-like? I don’t really have one, except that I like it. We don’t usually get birthday or Christmas gifts for most of our friends, or any of our neighbors, so this is a way to give them something and say, “Hey, guess what? We like you and appreciate you.” I mean yes it’s supposed to be anonymous, but apparently it’s not-so-anonymous. “How do they know it’s me?” I mean, I want to know so I can be less obvious. But this year, we have two friends who live close by, so I included them on my May Day basket rounds, and two new neighbors as well. I was hoping at least some people would be temporarily stumped, and no one has mentioned it [to me] except for one neighbor. But another neighbor said something to my husband. All right, so two people know, and they’re neighbors I did this for last year. But no one else should get it. But, then I have to take into account that our neighbors talk, so another two will be filled in, and unlike last year, one neighbor caught me… I think. I dropped off the basket and hightailed it out of there, but when I was on the sidewalk walking back to my house, I thought I saw their glass door open out of the corner of my eye, but I didn’t turn to get a good look because I wanted them to think I was just walking or whatever. If they called to me, I have an excuse as to why I didn’t stop. I’m deaf. And I really am, so I didn’t hear them call to me, but just in case they did, I have that excuse. This May Day I was much more organized so I think everything was a little nicer. I wanted to get every member of the household (including pets of course, because pets are family members) something just for them, but my husband refuses to participate beyond, “Whatever, you want,” so I have to come up with things myself, and I admit if you do seven baskets with an average of five family members each… well it’s hard to think of something personalized for everyone. Particularly some of the kids of some neighbors, because I don’t know them well enough to know their interests. And I don’t want to be a creeper about it either. Two families with kids, I know well enough to get personal. So I got a bottle of Sriracha in Thai for a girl who loves her spice, and bait for a boy who loves fishing and goes to the lake a few blocks away to fish (I don’t know if there are actual fish in it, but still). And then our newest neighbors have a toddler and a baby, so the baby I just got a Fisher Price toy that was age-appropriate and the toddler loves soccer (or so I’m told) so I got him a Little Tikes soccer ball. The other three baskets with kids were pretty much the same. I got a bubble gun with a thing of bubbles and a big pack of sidewalk chalk. I know that some of them use sidewalk chalk, so I just crossed my fingers and hoped all of them could enjoy it. Hey, I’m ready for summer, and I’m sure they are too. For the adults, I was looking at candles and bird houses and such. I wanted to try and get away from candy. I mean, I bring neighbors cookies or cupcakes or something else I have baked five or six times a year. And I make them from scratch so they’re definitely not light on the sugar. I don’t want them to think I’m trying to give them diabetes! However, my husband was very, “not that, not that,” to my suggestions so I broke down and got everyone chocolates, except for one friend whose partner is a gluten-free vegan; I got them special muffins that went with her diet. I also got everyone a grill rub, and tried to match the rub to what I thought people in the family might like. And of course, everyone got a small thing of flowers. I mean it’s May Day, not random gift day – you have to have flowers. For those with cats, I got them a thing of cat treats and those with dogs got home-baked (not by me, I’m not that awesome, but there is a wonderful pet bakery about a mile away from us) dog treats. 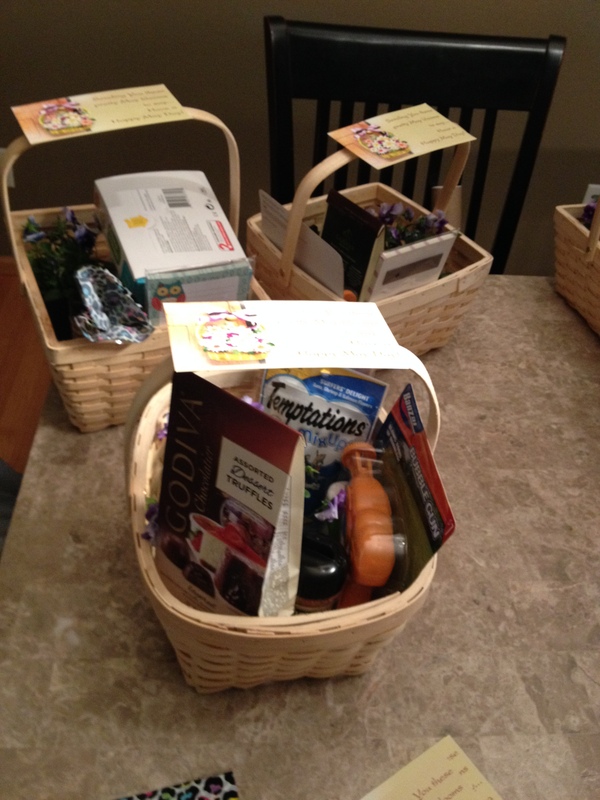 This year I dropped off all of the baskets to my neighbors early, around 10:00. Then the two friends who are close, but not in the neighborhood I dropped in the early afternoon. I thought it was over, until late that night, I’m old so you know… around 9:00 in the evening, our doorbell rang. By the time we got to our door and opened it, no one was there, but one of the baskets I delivered had been returned, and inside were all these treats for us. Whoever did it knew us well, because they knew our dog’s name, leaving her a small container of treats and they also knew about my own obsession with Sriracha sauce, and got me a sweet Sriracha t-shirt. Our mystery benefactors also gave us some cookies and something for our cat. At first I suspected our neighbors across the street, but when I thanked them they said they weren’t behind it. Then I realized it was probably our friends who live about five minutes away. Their dogs have special diets because of allergies, so it might have been me giving them treats the dogs could actually have that gave me away. I’m pretty sure I wasn’t seen by either of them, but their house has a lot of windows so I’m not sure. I’m 98% sure it was them, but then again neighbors talk so it very well could have been another neighbor that found out that I like Sriracha and knew Angel’s name. I mean at least three of the five neighbors know her name. I’m not used to being on the receiving end of May Day haha. I might bring it up to our friends that I mostly suspect, because Angel (our dog) is nuts for whatever treats were in the basket. Like, I’ve never seen her go so crazy for something, besides wet food, which we only give her on special occasions. It’s like dog nip! And for that reason, I want to know who left the basket, so I can procure these magical doggie treats. This entry was posted in Family, Holidays, home, Life, Personal, Relationships and tagged "May Day", anonymous, flowers, may day basket, stealth, stealthy, surprise, traditions, treats, undercover. Bookmark the permalink. 0 Responses to Have A Happy May Day: Someone Tried To Out-Sneak Me!